Swarovski crystal round medical alert id key chain has swaroviski crystals around the outside edge! 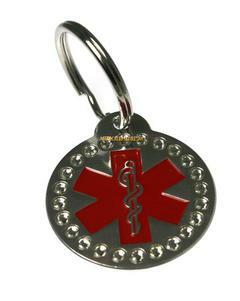 Our swarovski crystal round medical keychain is made of anodized aluminum and measures appr. 1 1/2" x 1 1/4". Can be custom engraved with up to 5 lines at no extra charge.Perfect as a key chain or can be used as a luggage tag, on your childs book bag or even your infant or babys' diaper bag.